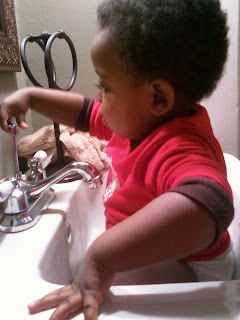 For about the last two weeks Landon has become obsessed with washing his hands. It has nothing to do with having good hygiene and everything to do with making a huge mess with the water and soap. 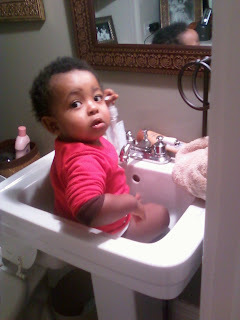 As soon as he hears the water running anywhere he runs to the bathroom yelling "wabba, wabba" (landon language for wash). This particular day he got a little carried away. I had just finished changing his diaper and he ran away from me as soon as I had his onesie snapped. It is always a chore to actually get his pants back on because my little guy can only lay for so long before he runs off. So, I went into the bathroom to wash (wabba) my hands whenLandon came charging after me. I think he had this planned in advance!! I lifted him on my knee so he could wash too. Before I knew it he was in the sink and had the biggest smile on his face. He fit perfectly and looked so adorable. I thought, If he is actually going to sit then I will take advantage of it. 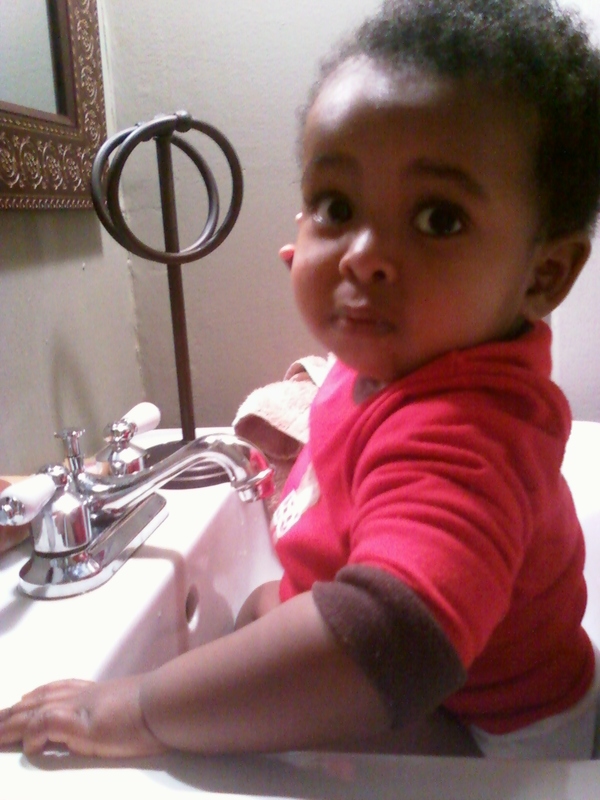 He played in the sink for one full hour. He had so much fun just looking at his reflection in the faucet and then smearing it with soap. It's the little things that make him so happy. I took a half hour shift watching him until Ian got home from work and then he sat and watched him for the second half hour. Landon was a little sad when EXTREME WABBA came to an end but he still had bath time to look forward to.